Operators of interstate bus services between Uganda and Rwanda are counting heavy losses almost three weeks into the closure of the common border by Rwandan authorities. In Kampala, Trinity Bus Company based on Namirembe road in Kampala is one of the most affected. While the company's buses also ply the Juba, South Sudan and Goma, Democratic Republic of Congo routes, the jewel in their crown has, until recently, been the Kampala-Kigali route. An employee, who spoke to The Observer off the record last week, revealed that Trinity has been sending an average of 10 buses to Kigali daily. That figure has almost been halved since the stand-off at the border started. 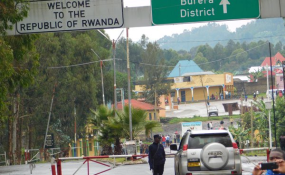 At both border points at Katuna and Kagitumba, passengers of all nationalities are allowed entry but Rwandese nationals are not allowed to return to Uganda. This has led to a decline in the number of buses going to Rwanda. Usually, the Trinity Bus terminal is a beehive of activity with over 15 buses on the ready to load passengers at a time, but on the day The Observer visited only two buses were parked at the terminal. One that was about to set off was heading to Juba. Across the road at Jaguar Bus terminal, there seemed to be more activity with a lot more passengers booking their trips. Jaguar plies more Ugandan routes to Kabale and Kisoro in southwestern Uganda which could explain their relatively larger numbers. When we spoke to a person at the terminal, he said business was normal save for the fact that Rwandese citizens are not being allowed to leave Rwanda for Uganda. One man who only identified himself as John, said he travels between Kampala and Kigali, revealed that "Nyabugogo bus terminal in Kigali has very many buses parked but few are leaving the terminal to come to Kampala. They are also not as busy as they have been." "This thing [border closure] has affected transport on both sides," he said. Bus fares remain at between Shs 40,000 and Shs 45,000 for trips to Kigali and Shs 60,000 to Kanyaru, a border town between Rwanda and Burundi. For passengers heading to Kigali, the immediate worry is if they will be allowed to cross the border. This is especially the case with first-time travellers and persons holding temporary travel documents. Before the border was closed, it was possible for one to cross without a passport as long as one had either a temporary permit or national ID card. There has also been a challenge posed to Rwandans who hold dual citizenship as they seem to be the most affected. Depending on what documents you present at the border, your return journey might not be guaranteed. Some who presented Rwandese passports while entering the country initially have been refused return to Uganda, according to John. Others, therefore, are choosing to present Ugandan documents. The risk for them is that picking one over the other is almost equivalent to renunciation of the other, a difficult situation for most. The journey also takes longer as the checks at the border points have since intensified. It is a difficult time for businesses which relied on the free movement of goods and persons until the political tensions between the two governments escalated into the drastic action by Kigali.